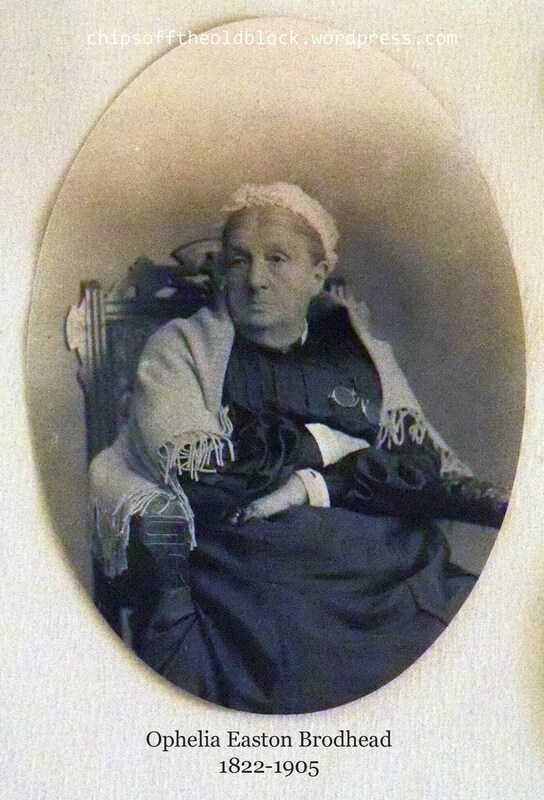 Margaret Wait Lewis (b. Perth Amboy, NJ, March 7, 1817) is a 3rd great grandmother to me. 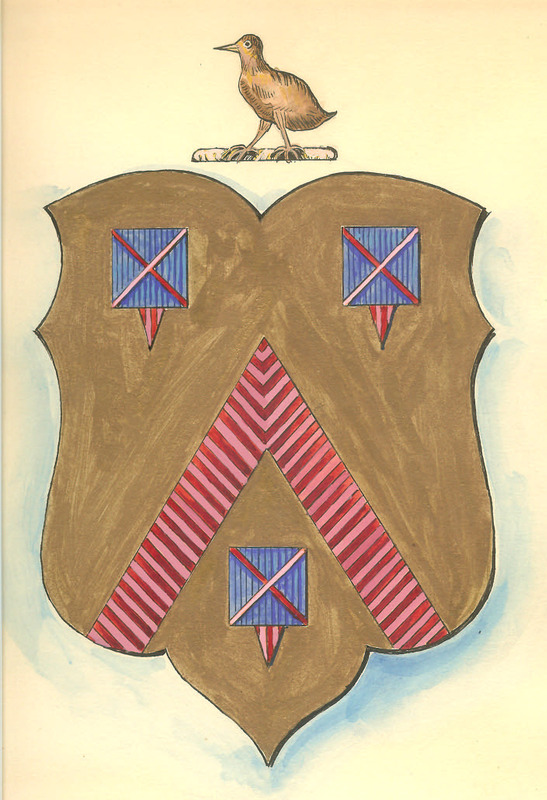 She was the wife of Juebb (Jacob) Lewis and the oldest of three daughters of John Oliver Wait and Elizabeth Crow. Margaret died in Perth Amboy on March 26, 1851, at just 34 years of age. I’d long wondered what took her, and so I sent off for her death certificate. It came in the mail today. Cause of death: consumption (a.k.a. pulmonary tuberculosis – an infectious bacterial disease of the lungs). Note: I’d always had her date of death listed as 26 March; the certificate says 25 March, but the entry in the Wait family Bible corroborates the 26th as being the date. She is listed as “married” so her husband Juebb appears to have survived her—that’s the first morsel I’ve discovered about him. Anyone with more information, please get in touch. 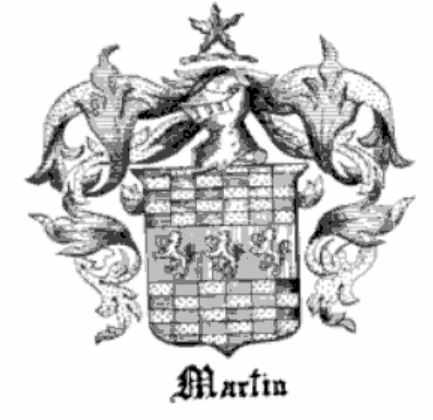 Margaret and Charles were very close, in fact, my father was named after Charles Martin. 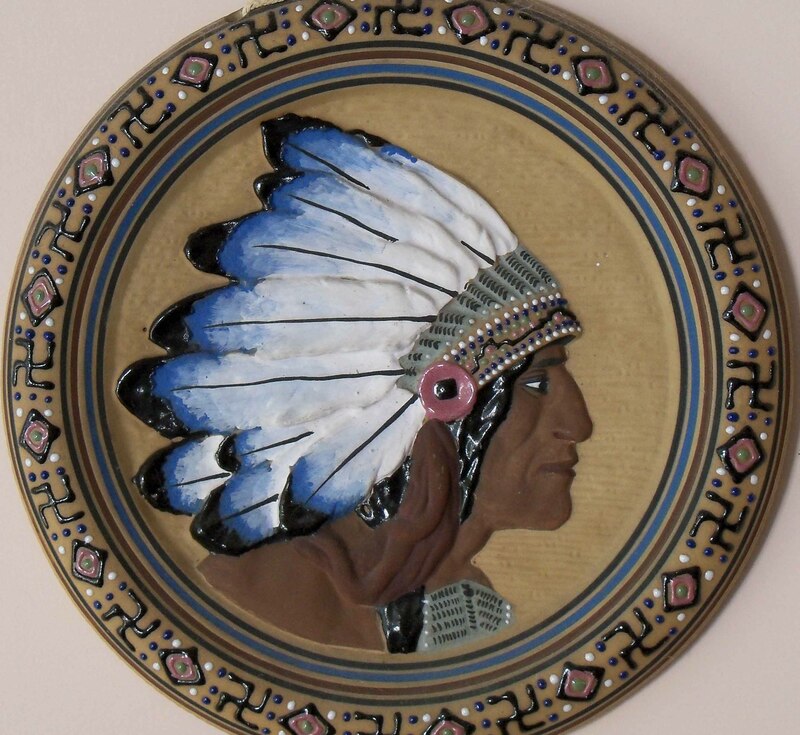 In my late Dad’s memoirs, he wrote about celebrating his 7th birthday and receiving the Indian plate shown here as a gift from his Uncle Charlie: Uncle Charlie was a favorite of mine… He was general sales manager of Clark Thread Corporation. Lived in an old brownstone in Tottenville, Staten Island. He was an antique fancier and had at least 100 old clocks which all chimed at the same time. I used to love to visit there. 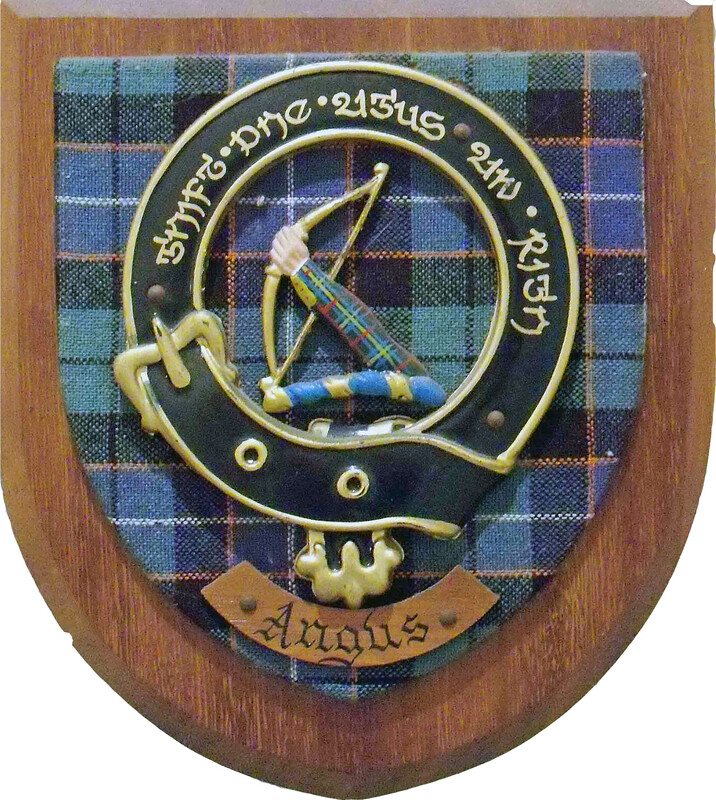 He had an old friend, Tom Alexander (a Scotsman) who lived with him. We always had Uncle Charlie and “Uncle” Tom with us for Thanksgiving and Christmas. Pop and I would go down to the Staten Island ferry terminal and pick them up. Uncle Charlie liked a little sauce now and then. So to celebrate, Pop would whip up the Brodhead cocktail: 1/3 orange juice, 1/3 dry gin, 1/3 rye whiskey, a dash of grenadine, lots of ice, shake it up and enjoy. Uncle Charlie was a tall, very distinguished-looking man. White mustache and white hair. Everything he bought came from the likes of Tiffany, Wanamaker, Van Cleef & Arpels, and the like. Uncle Charlie died right after I was sent to Parris Island, so I did not get to his funeral. Charles had amassed a fortune in antiques by the time of his death, and his estate was auctioned off on October 12, 1943. A six-page booklet was prepared for the event by Jacques Noel Jacobsen. I remember my Dad saying that his parents went to the auction to bid on some of the items. Somewhere we have a news clipping on the event; if I come across it again, I’ll post it here. Below is the only photo I’ve ever seen of Charles Martin, and it is from the personal collection of James Brodhead of Everett, Washington. 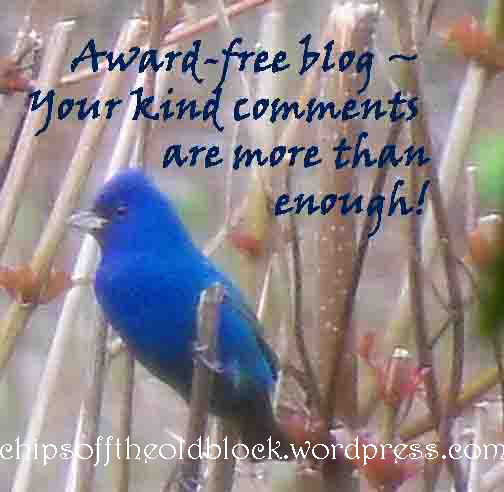 I thank him for allowing me to publish it here. Charles is standing in the rear next to his sister (my great grandmother) Margaret. Margaret is next to my great grandfather Andrew D. Brodhead who died in 1917. I suspect this photo was taken in 1916/17 as the little boy in the photo was born in 1912. I am wondering whether perhaps Uncle Tom is the gentleman in the middle next to Charles. 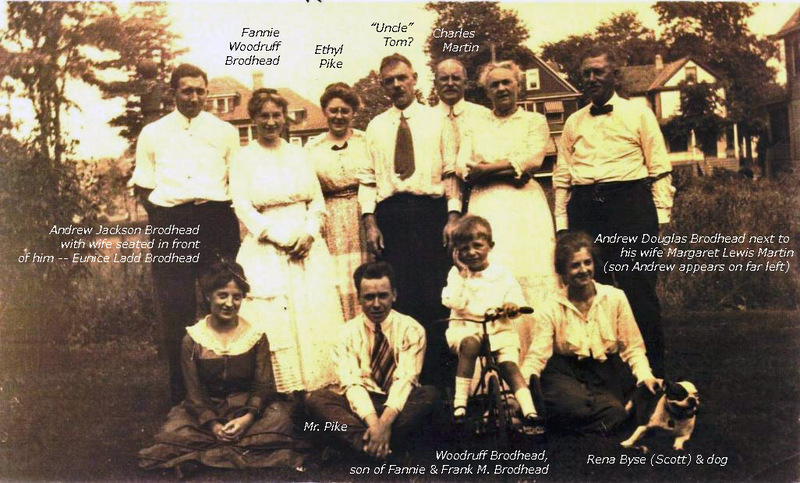 I’ve labelled one woman Fannie W. Brodhead although James and his family had her labelled as Ethyl Pike; but she looks so much like my grandmother (mother of the little boy in the photo who was my uncle). Maybe Ethyl is the lady behind Mr. Pike? My grandfather Frank Martin Brodhead (a brother of Andrew who appears in the photo) may very well have been the person behind the camera. It’s a fantastic photo, and I really treasure seeing the group together. BRODHEAD.–At Elizabeth, NJ, May 6, 1917, Andrew D. Brodhead, aged 64 years. Funeral service at his late residence, 732 Jersey Av., Elizabeth, NJ, Wednesday, May 9, at 2:30 PM. I don’t know who Emily was. The only clues that the letter gives is that Emily was also a widow and lived in a town called Kingston (probably either the one in PA or the one in NJ). And, she mentions children/grandchildren: We are going to have Cornelia operated on for adenoids and tonsils on Saturday and the plan is now for Beatrice to have his throat done at the same time. I am not very enthusiastic about that but shall not plan to decide for them. Update 6/20/13: This letter was from Emily Linderman Brodhead Moon, wife of the late Frederick Moon and sister of Andrew Douglas Brodhead. 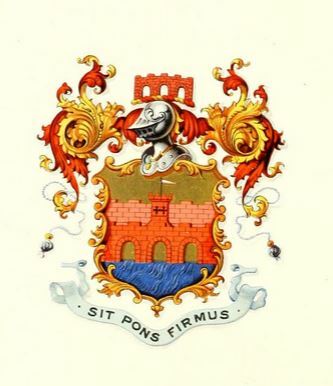 Emily lived in Kingston, Pennsylvania at that time. 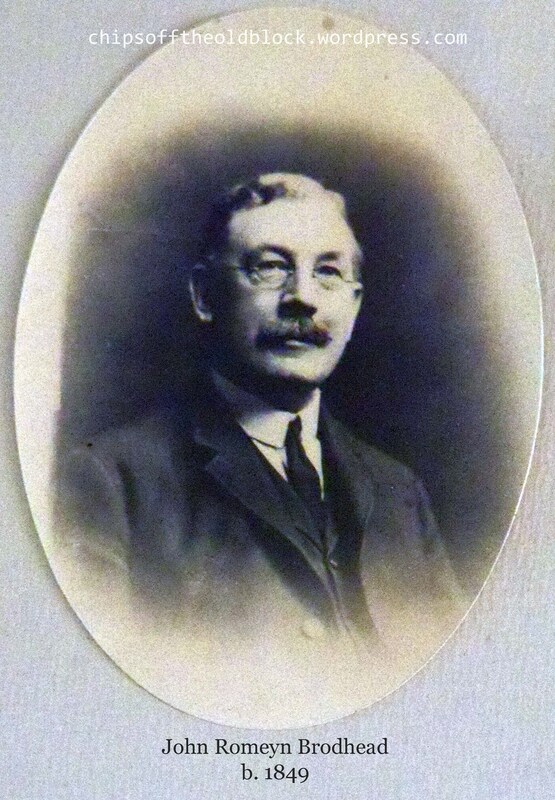 Frederick Moon died in 1907. Emily had one son, Frederick Wiles Moon (b. 1882) whose wife’s name was Beatrice (b. 1889, d. 1949). Beatrice & Cornelia were Emily’s grandchildren. Cornelia was probably named after Cornelia Dingman Brodhead (Emily’s grandmother). It was nice to come across this letter as it provides a brief glimpse into the kind of man AD Brodhead was; I have yet to come across any other information that offers such clues, the kind of clues that are the most interesting to know. 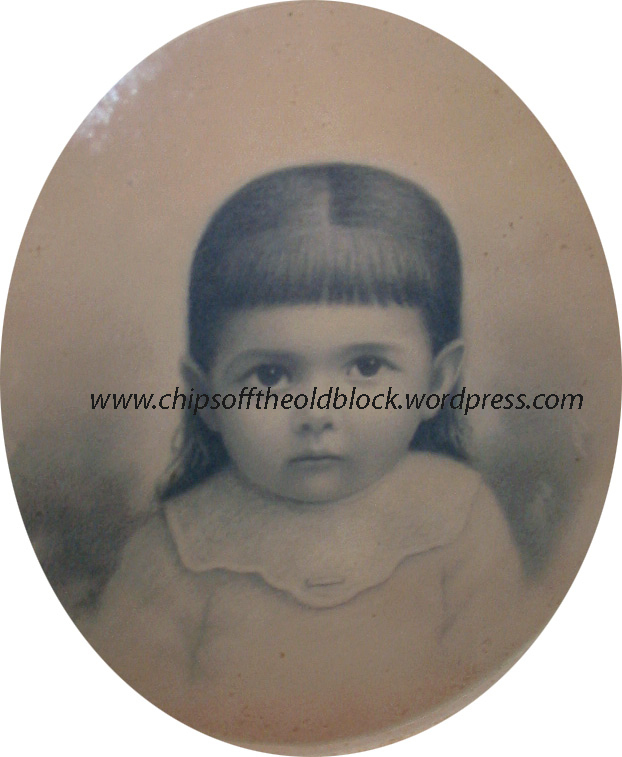 The recent post of the Andrew Jackson Brodhead family reminded me of this sweet little angel, Edith Easton Brodhead, who was born in Perth Amboy, NJ, on November 3, 1879. 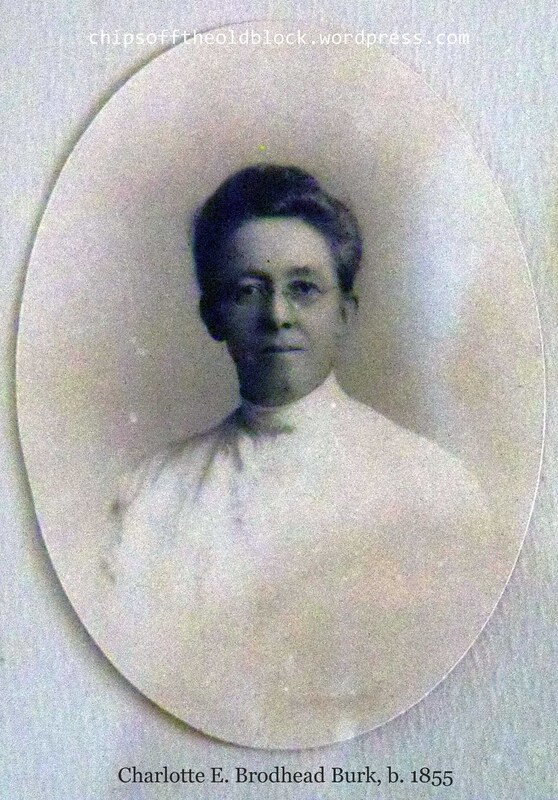 Both the assembly of photos of the A. J. Brodhead family and this portrait of Edith are in nearly identical frames. And both frames are quite large. The portrait of Edith is unsigned; there may be a clue under the mat, but because the frame is very old and the portrait is under glass, I don’t think we’ll be taking it apart any time soon. I plan to write away to the NJ archives to see if I can find out her cause of death. I can’t imagine how sadly her loss must have been felt by the young couple. Perhaps the arrival of baby Frank the preceding month helped them cope with their grief. If Edith was taken by a serious childhood illness, thankfully it did not take Frank as well. Over the years, I’ve often looked at Edith’s little face and felt sad to think of her loss at such a young age. Makes one appreciate one’s own survival of childhood. There was a time–not all that long ago–when such losses were very common. Little Edith must have brought great joy to those around her during her brief time on earth. That is what I now try to remember whenever I see her precious little face. 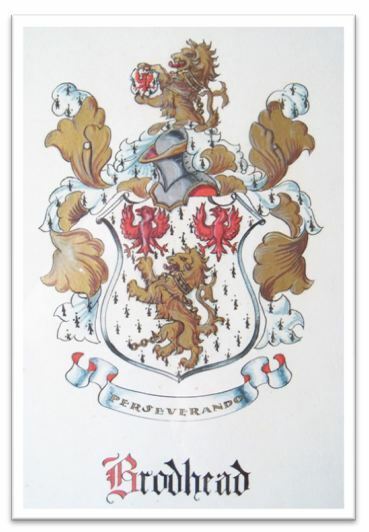 You may recall a previous post about Robert Packer Brodhead in which I related that much material was available about the Brodhead family from the book Colonial and Revolutionary Families of Pennsylvania. 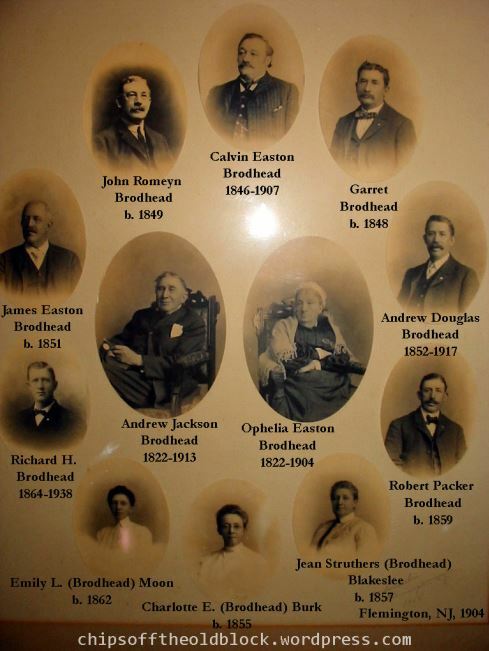 We are very fortunate to have a large framed photo display of Robert’s father and mother, Andrew Jackson Brodhead and Ophelia Easton, together with Robert’s nine siblings. The display was assembled in Flemington, NJ, in 1904, and must have been compiled in the early part of the year since Ophelia passed away that April, some 18 months shy of what would have been her and her husband’s 60th wedding anniversary. Son Calvin died several years later, in 1907, from gastritis*. 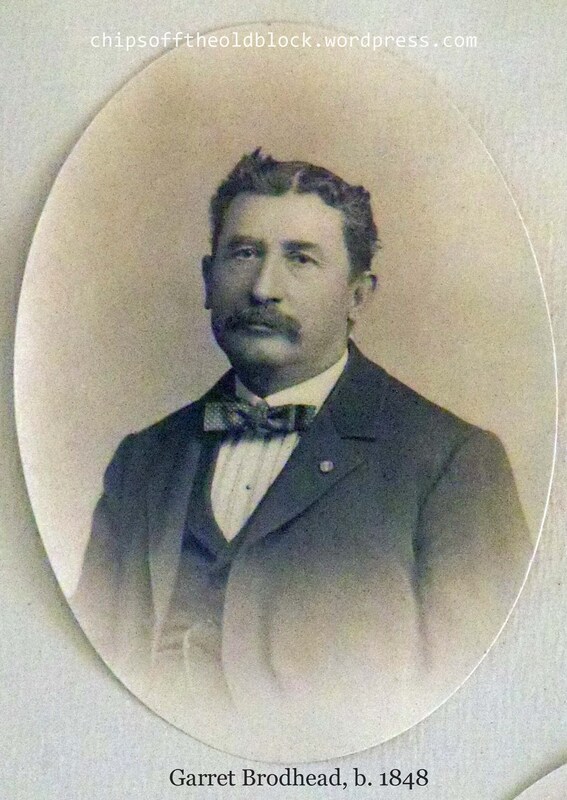 Andrew Jackson Brodhead died at 91 in 1913. So this assembly of photos is a wonderful thing to have. My great grandmother Margaret Lewis Martin can be credited with identifying each person. She died in the mid-1940s but at some point before then created a diagram showing who was who, and attached it in an envelope to the reverse side of the frame. Below in italics is material on the Andrew Jackson & Ophelia (Easton) Brodhead family excerpted from John W. Jordan’s 1911 book, Colonial and Revolutionary Families of Pennsylvania, in three volumes, published by Lewis Publishers of New York. Note: I cropped the individual photos from the compiled version above; also, please note that Mauch Chunk in Carbon County, Pennsylvania, is now known as the town of Jim Thorpe. Click the preceding link to peruse the interesting materials on the Mauch Chunk Historical Society’s website. Andrew Jackson Brodhead, third son of Garret and Cornelia (Dingman) Brodhead, was born in Northampton (now Pike county), Pennsylvania, May 6, 1822. He received his early education in the common schools of the towns in which his parents lived, at the Dingman Academy, and a term at the Stroudsburg Academic School. He taught school one year, and in 1850 began working in Mauch Chunk, Pennsylvania, where he removed his family in 1851. 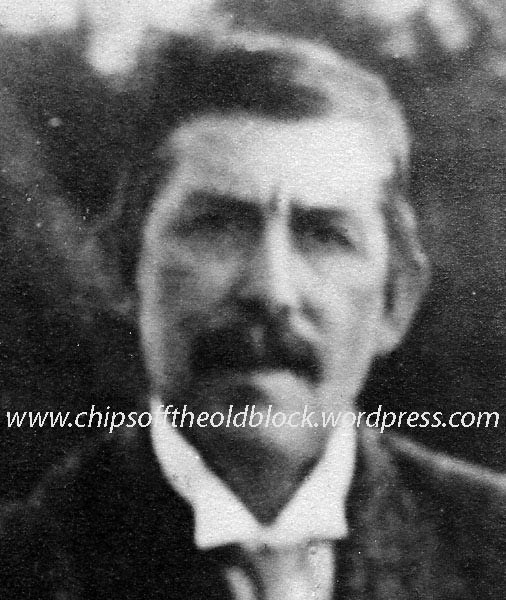 From 1851 to 1857 he was employed as clerk and bookkeeper, and for five years was in business with a partner, repairing cars used by the pioneer coal company of that region. About 1861 Mr. Brodhead began shipping coal for other producers, and in 1877 opened a general store at Hickory Run, Pennsylvania, where he lived until 1883, when he returned to Mauch Chunk. 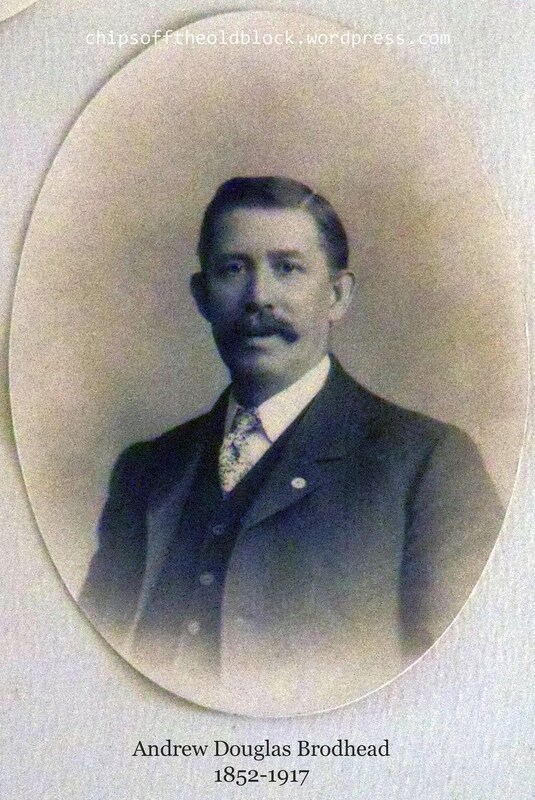 In 1884 he removed to Flemington, New Jersey, his present home. 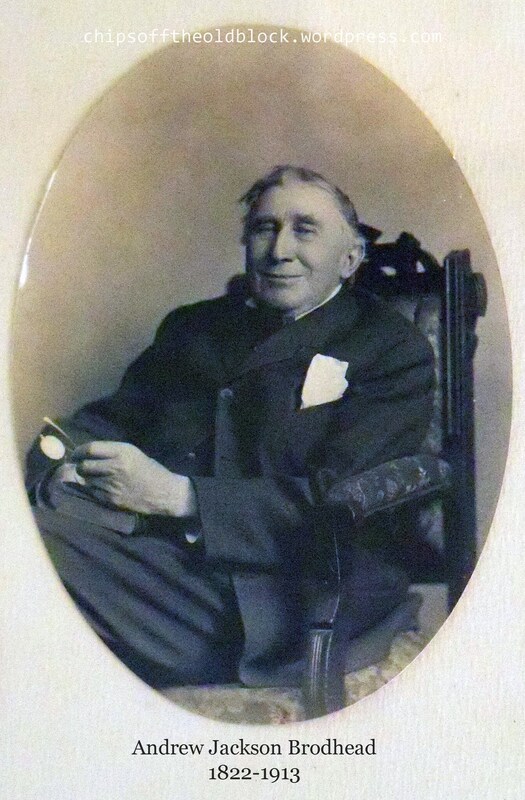 In 1868-69 he was treasurer of Carbon county, Pennsylvania, for several years he was school director of East Mauch Chunk, and served as justice of the peace. 1. Calvin Easton, born in Pike county, Pennsylvania, December 27, 1846; married (first) December 6, 1870, Laura Clewell Leisenring, born at Mauch Chunk, August 9, 1848, daughter of Alexander William and Ann (Ruddle) Leisenring. They had Anna Leisenring, born November 12, 1871; Emily Easton, born November 3, 1872; Alexander William, January 1, 1874; married (second) at Oakville, Canada, Mary Lewis, who died March 31, 1905. 2. Garret, born in Pike county, Pennsylvania, February 11, 1848; married, September 17, 1872, Annie Kocher, born in Mauch Chunk, August 25, 1849, daughter of Conrad and Catherine (Wasser) Kocher. Seven children: Conrad and Andrew Jackson (twins), born July 19, 1873; Alonzo Blakeslee, December 26, 1875; Calvin Easton and Laura Leisenring (twins), born September 21, 1878; Ruth Randall, born March 7, 1884; and Garrett, born January 3, 1888. 3. 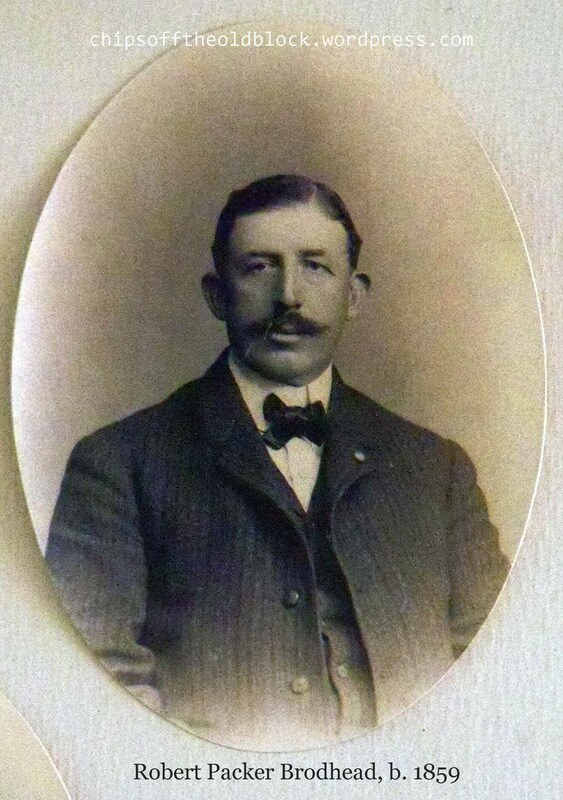 John Romeyn, born in Pike county, Pennsylvania, June 11, 1849; married, November 13, 1882, Mary Martha Holbert, born in Chemung, New York, March 22, 1858, daughter of Joshua Sayre and Catherine Van Houton (Ryerson) Holbert. They had Henry Holbert, born September 29, 1883, and Arthur Sayre, born November 26, 1886. 4. 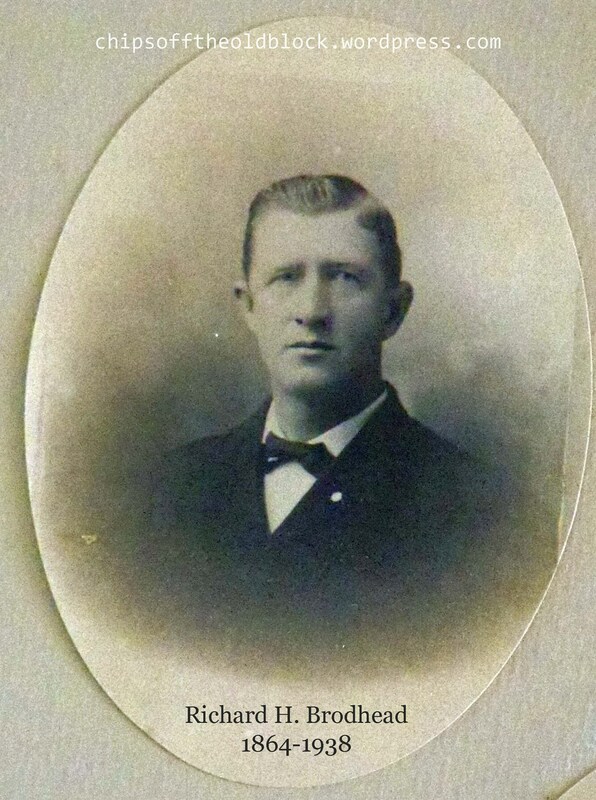 James Easton, born in Pike county, Pennsylvania, February 22, 1851; married, May 1, 1877, Hattie Lochlin Boyd, born July 11, 1852, daughter of Nathaniel and Jane (Curran) Boyd. They have Walter, born March 9, 1878; John Romeyn, born September 25, 1880; Frederick Moon, born July 31, 1883; and Nathaniel Boyd, born June 22, 1891. 5. Andrew Douglass [misspelling by author, should be Douglas], born in Mauch Chunk, Pennsylvania, August 17, 1852; married Margaret Lewis Martin, born January 15, 1859, daughter of Moses and Sarah Augusta (Lewis) Martin. 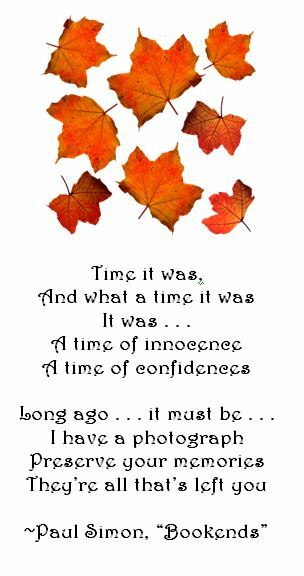 They have Edith Easton, born November 3, 1879; Frank Martin, born February 5, 1882; Lewis Dingman, born October 5, 1884; Andrew Jackson, born October 3, 1886. 6. Charlotte Easton, born in Mauch Chunk, December 11, 1855; married, October 5, 1887, Franklin Clark Burk, born in Flemington, New Jersey, April 8, 1853, son of Peter Wilson and Clarinda (Bellis) Burk. 7. 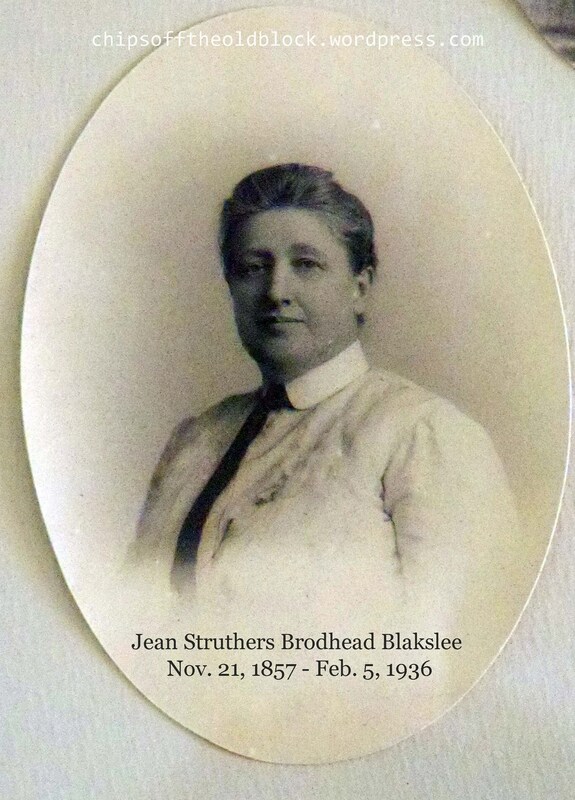 Jean Struthers, born in Mauch Chunk, November 21, 1857; married, October 15, 1885, Charles Ashley Blakslee, born in Mauch Chunk, July 4, 1859, son of James Irwin and Caroline Jones (Ashley) Blakslee. They have Gertrude Easton, born June 21, 1887, and Ophelia Easton Blakslee, born January 9, 1895. 8. Robert Packer, see forward [of book]. 9. 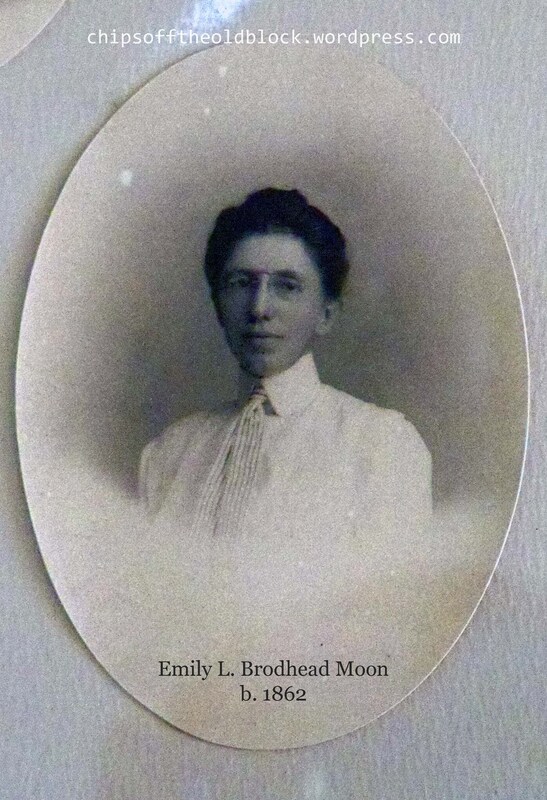 Emily Linderman, born in East Mauch Chunk, June 1, 1862; married Frederick Moon, born September 30, 1851, son of Samuel and Matilda White Moon. They have Frederick Wiles Moon, born July 27, 1882. 10. 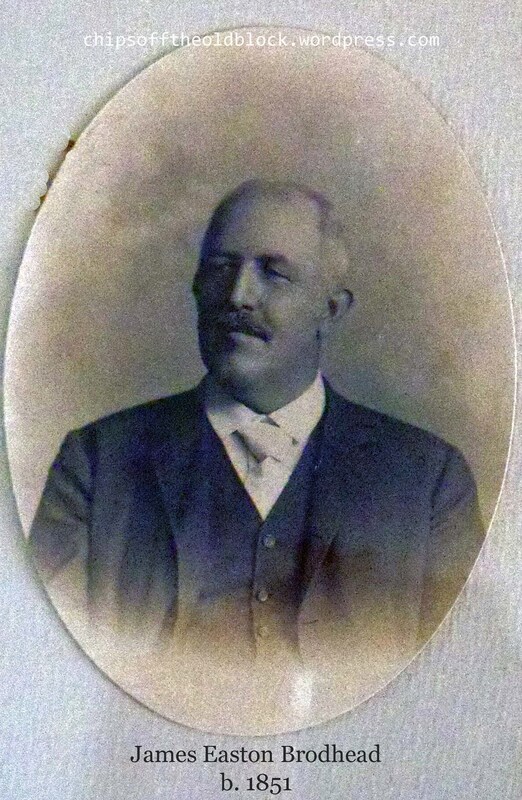 Richard Henry, born in East Mauch Chunk, November 4, 1864; married, March 6, 1890, Jane Vanderveer Smock, born October 15, 1861, daughter of Daniel Polheim and Sarah Jane Smock. They have Estelle Smock, born November 26, 1890; Mary Ophelia, born April 2, 1892; Jean Blakslee, born July 3, 1893, died July 27, 1893, and Richard Henry. Quite a few of their resting places have been documented, and in some cases photographed, on Find a Grave’s website. If you go to Andrew Jackson Brodhead’s entry (click here), you can click on links to others of the family who have been documented. *Note re: Calvin Easton Brodhead, his May, 1, 1907, obituary in The Reading Eagle stated: Calvin E. Brodhead died suddenly in New York City of gastritis. He was born in Pike County in 1846. 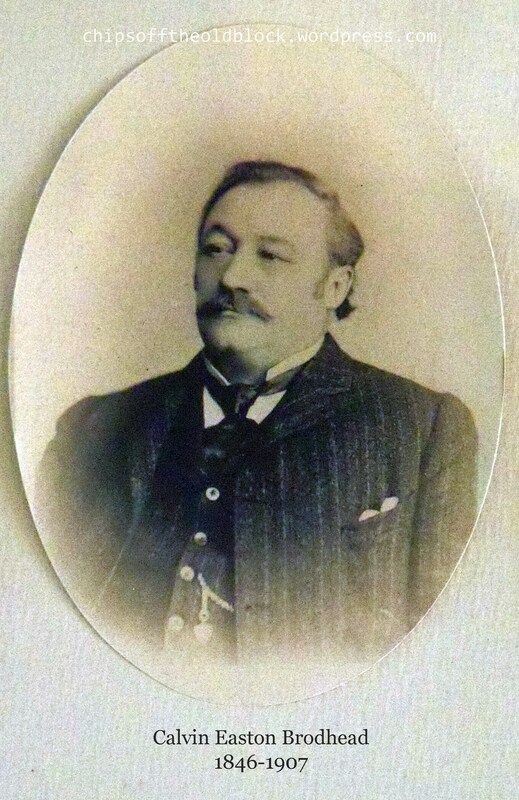 He was widely known in contract affairs, having served as chief engineer of the Lehigh Valley Railroad for some time. In 1872 he supervised the construction of the Easton and Amboy division of the road. He was well known in Flemington, NJ, where he lived before locating at Mauch Chunk. In the last post, I alluded to a puzzle in the tree of John Oliver Wait, son of David Wait. What I was referring to was the fact that the Wait family Bible lists two children in addition to John’s twelve children with wife Elizabeth Crow: Sarah Augusta Lewis and Charles Smith Lewis. Their dates of birth are such that they could not have been Elizabeth’s children as Elizabeth gave birth to other children around that time. This left me mystified as to whose children the Lewis kids were. It seemed odd that they had a different surname from Wait. I wondered if they belonged to one of John’s oldest daughters, but I dismissed that idea a bit since the eldest daughters were still quite young. Moreover, I would have expected to see a marriage to a Lewis listed for one of the girls. Then I read about the founding of the first Presbyterian Church in Perth Amboy by Capt. John Angus, David Wait, and John Lewis, and it occurred to me that those families and their descendants were probably pretty intertwined. Perhaps the Lewis children were adopted by the Waits after some tragedy in the Lewis family. So, much like the blog entry Truin and Trewin, Thomas and Thos, this goes to show that it can really pay off to be creative with your searches. Who would ever expect to find Sarah A. Lewis, by using Augusta for her first name? Not me, anyway. (Incidentally, later records for her replace the “Augusta” with “Ann”.) And then for that misspelling to lead to another record with a misspelling of Smith, and then that to lead to Margaret Wait misspelled as Waili. In summary, my original thought that the Lewis kids were children of one of John and Elizabeth’s daughters was correct. 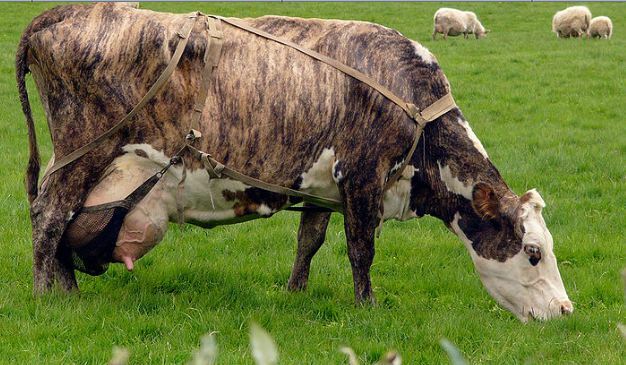 Margaret gave birth at age 16 and then 18. She was still living with John and Elizabeth when she was 34 (as per the 1850 census). Her surname is listed as “Waite,” not “Lewis,” so I don’t know what happened to “Juebb.” The 1850 census does not describe Margaret as a widow, but I assume he may have passed away. Margaret herself passed away in 1851 at the young age of 34. Charles Smith Lewis married Nancy E. Lewis, an Indiana native. He was already in Macon Co., Illinois, in 1860, at age 25, according to census records. He is listed then as single. By the 1880 census, he is listed with Nancy, 7 years his junior, and three children: Margaret A., Sarah E., and Charles W. (18, 13, and 6, respectively). His occupation is listed as “lumber dealer.” The death record lists Charles Smith Lewis as being buried in Hall Cemetery in Blue Mound, Macon Co., Illinois. I searched Find a Grave’s website for any Lewises in Hall Cemetery and found C.S. Lewis and Nancy E. Lewis. (I’d never have thought to search for him under “C.S.”–just one more bit of evidence to suggest creativity is vital when searching records.) May they rest in peace. 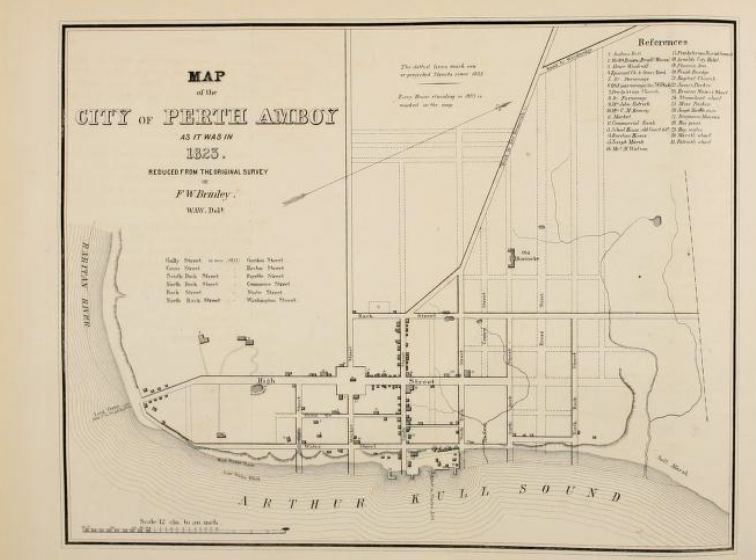 I’ll keep researching the Waits in Perth Amboy, but at least now, that one big puzzle has finally been solved!